I’m in Kathmandu and thinking of you. I visited the Swayambhunath temple this afternoon, up on its hill overlooking the valley. Beautiful, absolutely beautiful, and it opened me up in the way only real beauty can, cut through all the jaded traveler in me. I haven’t been home since we worked together a year ago – you know that. It will be time for me to return to San Francisco soon. 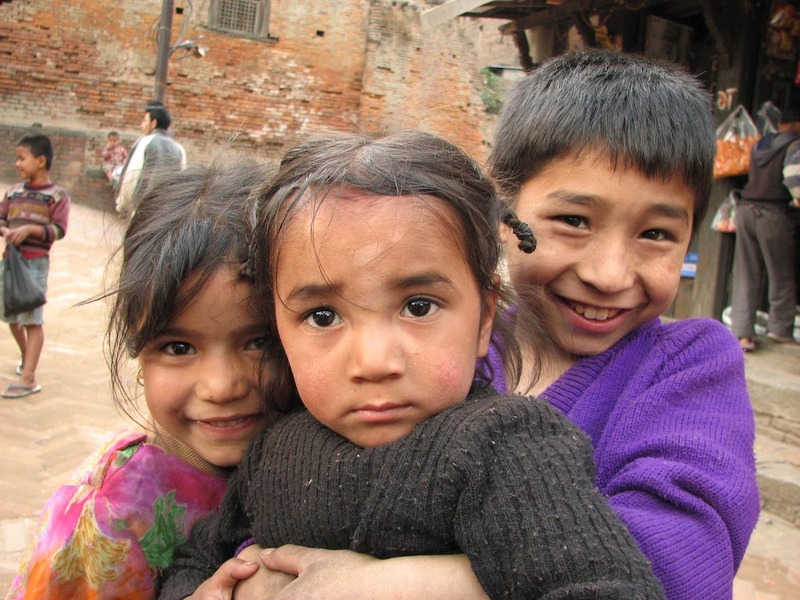 But what I wanted to talk to you about today is the two little boys that accompanied me to the temple and back. It must have been six in the morning and I was in the kitchen with Naomi, and we were trying to figure out if the party meant anything. This always happens to me. Probably it’s because I’ve ended up at some very good parties. This one involved poets and a hundred black berets, and fresh-baked cupcakes for breakfast. Naomi looked fabulous and she really was Danger Girl that night, and we were trying to understand whether that amazing energy, that vortex of possibility that surrounds any truly good party, whether that could save the world. I remember this blender, though I didn’t remember owning it. In another box I find my emergency medicine textbooks. Among my former desk contents, a box of staples and a rainbow plastic slinky. Enameled Japanese-style soup bowls come out of newspaper. Everything comes out of boxes. I’m finally back “home.” I finally have an apartment. I can now own more than I can fit into my backpack, and suddenly I have a great many jackets and an abundance of fresh memories. I unpack more books and try not to think of these objects as my life. My stuff is not me, I keep insisting. A friend of mine says he learned this very clearly when his house burned down. How marvelously zen. I can’t throw out my first girlfriend’s leftover lingerie. Or my iPhone, which traps me. I’m secretly ashamed of it, not because of the geek lust I feel, but because of its semiotics. To the casual observer, it pegs me as exactly what I am. Is some part of me an iPhone? Not only is the produce cheaper, but I don’t recognize most of it. I stand in front of bushels of something leafy and green, and discover that I can’t even read the name. I like this. Behind me there are tentacled things on ice, and sea snails. I had an excellent plate of sea snails in back alley of Saigon, and some others steamed on a beach near Danang. Those two incidents are the extent of my associations. Not so for my distant counterpart. Is there, I wonder, some Vietnamese kid who even now is returning home and going out with his friends? He grabs a plate of food, reveling in familiar tastes, and at the same time thinks: is this really me? This home cooking, is it my life? Because he got home that afternoon and started pulling all his old familiars out of big nylon duffels. He finds his old clothes, and a familiar pair of shoes. Knickknacks. Some books. But what books? What knickknacks? I have no idea, and this excites me tremendously. Everyone gets my jokes here; everyone grew up on the same cartoons and more or less the same food. Qarly found fish balls in my fridge the other day and said, ewww. What? Everyone eats them in Korea. I think. I don’t really know. They have completely different stuff there. If I was there I’d have completely different stuff too. I’d read different books and watch different movies and my nightlife would run in different neon veins. I might be someone else. Do I really want to keep unpacking? You close the door behind you in your new apartment. Your housewarming is in one week. It is pitch black. You cannot see the light switch. You walk along the wall with your hands. Fortunately, there is nothing to trip over in your empty apartment. You find a switch. Nothing happens. Have you an account with Pacific Gas & Electric? In the developed world, everything works. The power is always on, and most things are on time. The economists tell us we’re actually more efficient at just about everything; a quick look at a table of GDP per capita shows that the developed countries make dozens of times more money per person than the poor countries. Now I know that GDP isn’t everything; I know that money doesn’t always measure what actually matters. Still, I have to wonder at the implication that some countries do so much more per person than others. Now that I’ve traveled a bit, I know that it’s completely true. It really does take more work to get anything done in a less developed place. In the West-African country of Mali, the staple food is rice, which has a husk that must be removed before eating. 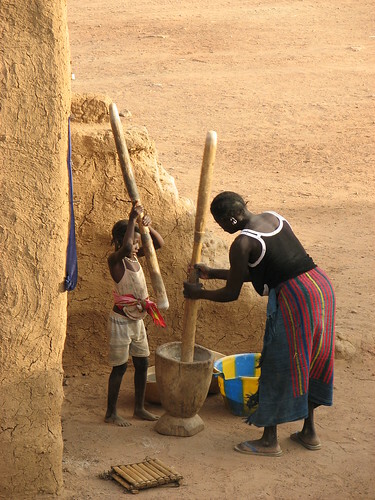 The women do this work, manually, by using large mortars and wooden pestles. It takes hours to prepare a single meal this way. I am about to run away for the weekend with some friends to play with fire art and motorcycles. There will be no ball games, fireworks, or kegs for me. There will be no Janet Jackson, no proud Amerfican Eagle, no barbecues, and no flags. I just never could connect with the symbols of the American Good Life. We do have propane, admittedly, but we have 800 pounds of it. We’re running a thing we built called 2piR, a sort of interactive magic platform. Standing on it, you can direct huge gouts of flame from 16 nozzles ranged around you in a 50 foot diameter circle. This is what we do for fun. This is our little piece of the future we’re building for ourselves — not the hardware, but the fact that we built it. My African friends said the meal was good. Just good. Frankly, it was gourmet, and I challenge anyone else to do better in a place with no water, no electricity, no paved roads. I’d made lamb skewers with onions and tomatoes and mango. Good? It was utterly delicious. I’d been eating rice for a month.